My new black chemise dress is pretty simple, so I wanted something more over-the-top for the accessories. I bought these vintage shoes on Etsy earlier this year, and while they were already a fairly decent faux-18th c. style, I thought they could still look better. 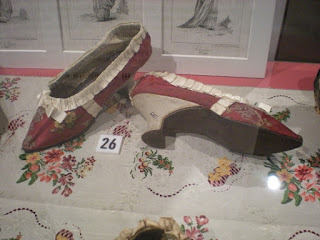 So I found an example of some buckle-less late 18th c. shoes and used this as my design inspiration. I cut off the bow and the fake tongue piece on my shoes and then box pleated some ribbon to cover the modern looking gimp trim. Then I just added my own satin bows to match the new ribbon trim and they were done! Although they are still way more theatrical than authentic, I think they look a little less 1980's-ish this way. I could probably press the box pleats to make the trim look a little more like the inspiration shoes, but I kind of like them being a bit silly and frilly. 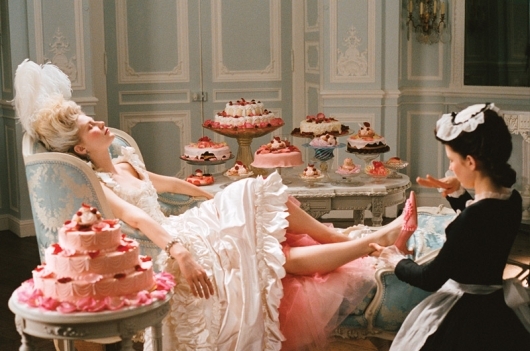 Plus, they remind me of some of the fabulous shoes from the movie Marie Antoinette. I finished my black chemise gown yesterday, so I decided to put it on a manikin and share a few pics showing the construction. It is so hard to see details on an all black dress in most photos, so I have adjusted the exposure so you can see everything more clearly. 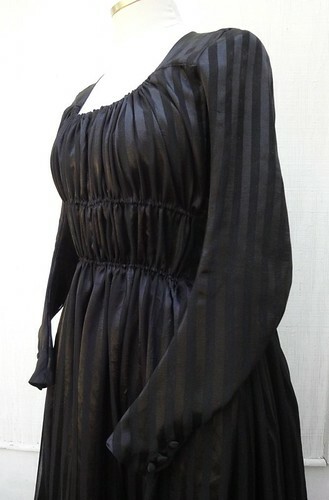 The gown is made of synthetic striped chiffon, and it is lined with black cotton voile. 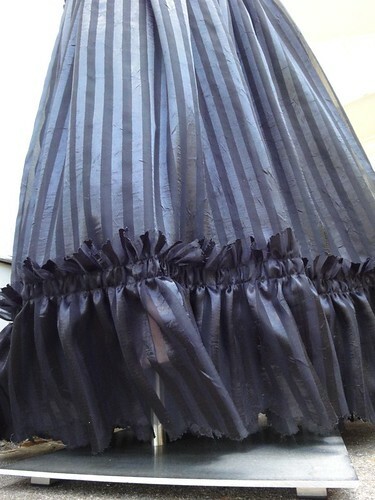 The fabric was originally crinkle chiffon, and I have spent countless hours trying to iron it flat. It got pretty close, but you can see that some of the crinkles still remain. 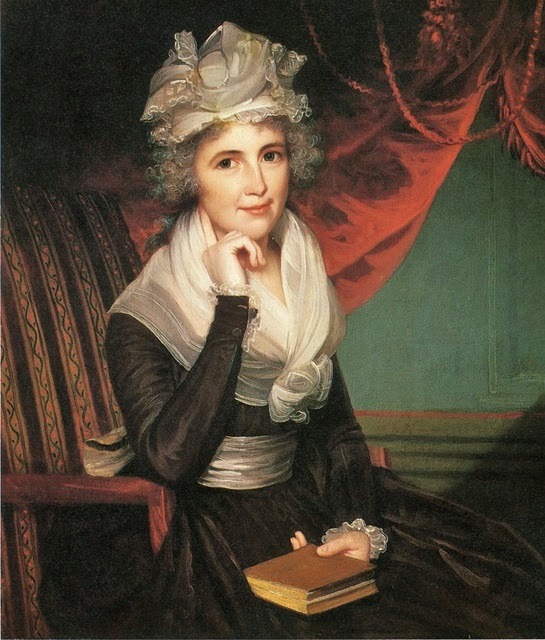 But I had my heart set on having a striped chemise dress like the one seen in this portrait, and this fabric was the only sheer black striped fabric that I could find. 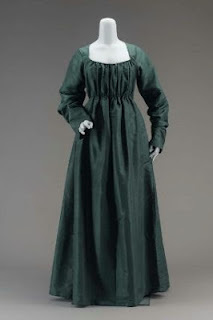 I based much of the construction for my dress on this green silk chemise gown from the 1790's. I was SO thrilled to finally see a back view of a fitted-back chemise gown, so I tried to make my own gown have a similar back. My pattern mimics the bodice seamlines, waist shape, and skirt pleating, although some changes still had to be made due to my tighter sleeves and the high back of my corset. 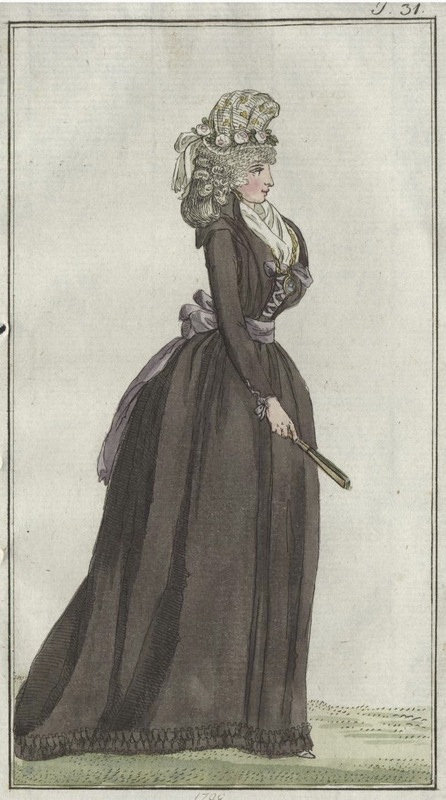 Many other elements of my dress were inspired by this chemise gown from the late 1780's, posted by Heileen of the Costume Hysteric blog. 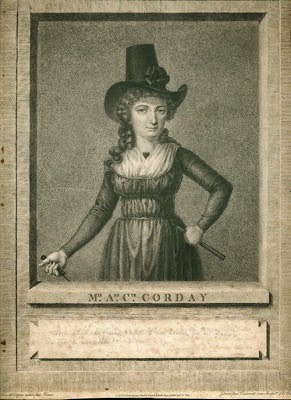 Like this example, my dress has tight sleeves with buttons at the cuff, a triple row of drawstrings across the torso, and a ruffle at the hem. To dress up the ruffle a little, I pinked the edges with some scalloped pinking sheers, and I really like the effect, but I'm not sure how well it would hold up if this dress was going to get a lot of wear and tear. My chiffon likes to ravel. 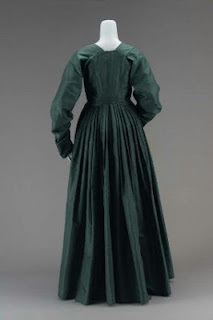 I have seen several theories about how these fitted chemise gowns were closed (I wish the museums included this information! ), but my personal theory is that most of them have a front slit that is concealed by the gathers in the fabric. There is a gathered-front jacket on the Abiti Antichi website that shows this type of construction especially well since one side of the gathered front is missing. 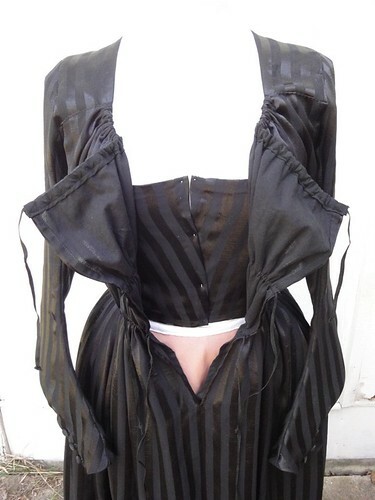 My bodice has a fitted under-layer that is pinned closed at the center front, and then the gathered outer layer has a opening that extends a little past the waist. The drawstrings tie in the center and just get tucked under the gathered outer layer. There is so much fabric there that you really can't see the opening once it is tied. I recently had a very interesting discussion with some friends about the difference between dresses made for historical reenactment purposes and "pretty-pretty-princess" dresses. Although I have tried to base my design on good historical research, the materials and construction of this outfit are 100% precent pretty-pretty-princess... and I'm totally okay with that! It was a welcome change of pace to make something where I didn't obsess over natural fibers or period construction techniques or try to do tons of hand-sewing. I think it will be a lot of fun to wear, and sometimes that's all that really matters. At the DWCG's first overnight event - Costumers' Lost Weekend - we decided to mix things up a bit. 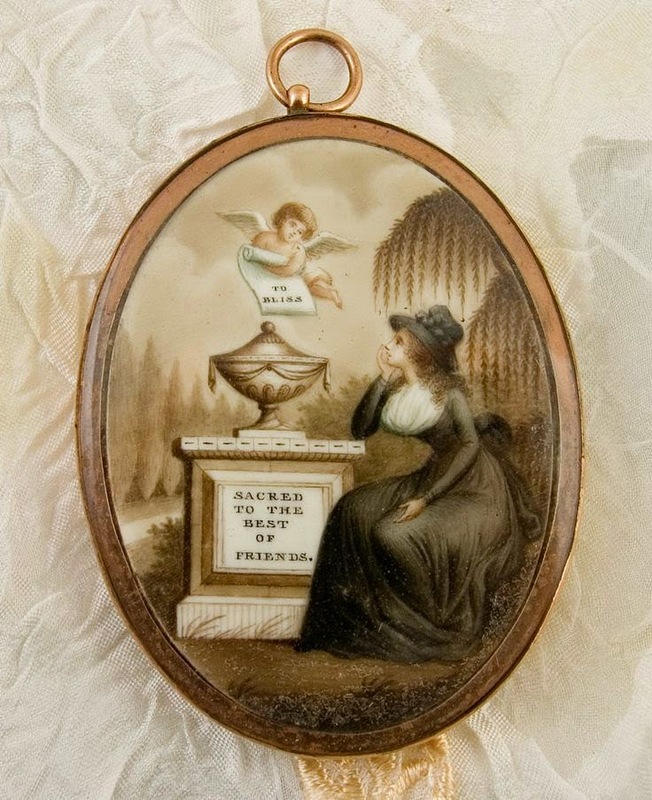 Instead of having a big fancy gala, we're going to have a Mourning Party. The idea for our mini-con actually grew from a few of us talking about having a "pity party" for the folks who can't make it out to Costume College this year, so we thought it would be cheeky and fun to have a party to mourn the fact that we are stuck here in Texas instead of living it up in LA. So now I need a black dress that would be appropriate for mourning. I tossed around a lot of ideas ranging from 1950's to Edwardian to Tudor, but I finally settled into the 18th c. after I stumbled across a few fabulous examples of black chemise dresses. 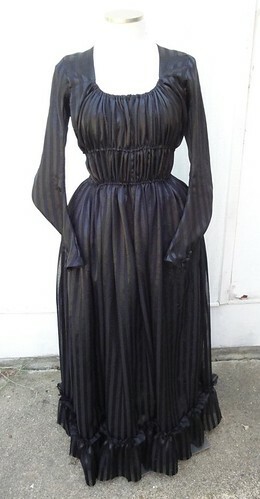 I had never considered the possibility that chemise dresses could be black, but once I started looking around, I was surprised by how many examples I found of the more somber versions of robes en chemise. It seemed like a really fun choice that is different from the foofy white dresses that you see more often. My dress is currently taking shape, and I hope to have some progress pictures that I can share in the next few days. 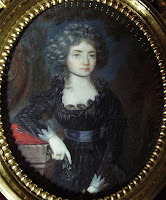 In the meantime, I thought I would show you all some of my favorite black chemise dresses from 18th c. art. All of these along with links to the original sources can be found on my chemise gown and late 18th c. luv Pinterest boards. 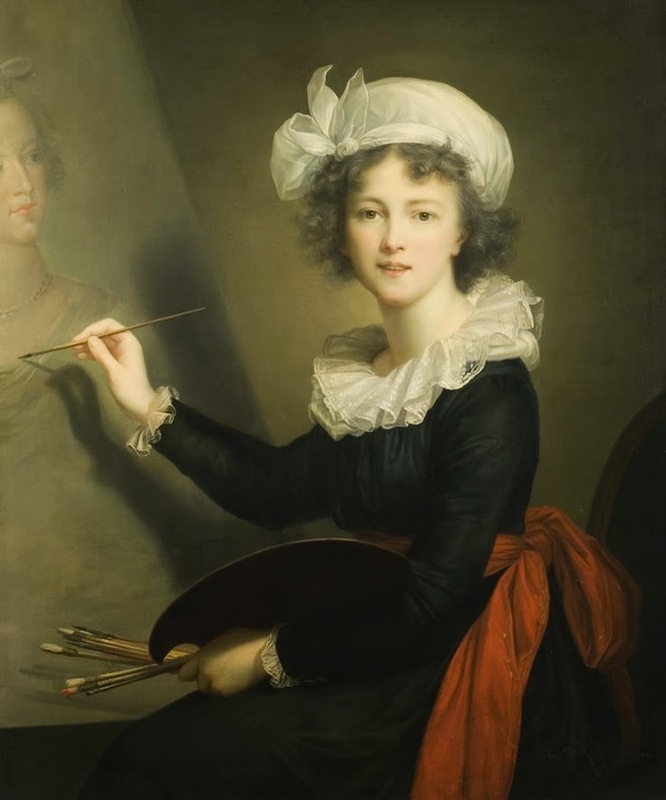 My dress isn't a direct copy of any one style, but I have combined elements from several of these paintings and illustrations to create my own version of a black chemise. 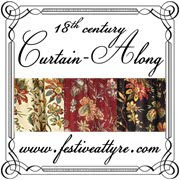 Well, as many of you have already discovered, my old festiveattyre.com website is down now. I am in the process of transferring my domain name so it will redirect to my new home here on Blogger, but that might take another day or two to start working. I have made a little process moving the old articles and galleries over to their new homes - you will find them under the "research" tab at the top of the page, just like at my old site. But I still have a lot left to do, so please be patient with me. I promise I will try to get it all over here eventually, but I'm in the middle of lots of sewing and planning work for the DFWCG's first ever costume retreat later this month (woohoo! ), so I haven't had much spare time to work on it. But my goal is to have it all back up and running smoothly again by mid-August.